More than 40 percent of American adults are deficient in calcium, magnesium and vitamins A, C, D and E. If your diet lacks these nutrients, you might consider taking a multivitamin. GNC Mega Men, one of the most popular multivitamins on the market, delivers a whopping 3,333 percent of the RDA of thiamin, 2,500 percent of the RDA of niacin and 100 percent of the RDA of vitamins A and E, chromium, manganese and iodine. 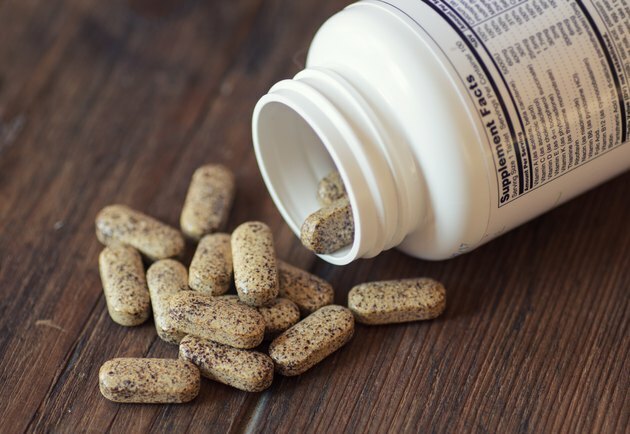 But is this supplement really safe? When it comes to nutrition, more isn't necessarily better. What Is GNC Mega Men? These supplements appeal to active individuals who want to look and feel their best. Each provides a unique blend of vitamins, minerals and antioxidants that support male health, sports performance, metabolic function and more. GNC Mega Men is a multivitamin that offers immune and cardiovascular support, promotes colon health and protects against oxidative stress. According to GNC, this formula is clinically tested and ensures a gradual release of nutrients. What differentiates the Mega Men multivitamin from other similar products is that it's lifestyle-specific. Furthermore, it must pass 150 quality checks before being sold to customers. It provides at least 100 percent of the daily recommended intake for over 20 vitamins and minerals, including key nutrients like vitamins C, B6 and B12. This supplement also boasts potent antioxidants, such as Alpha-Lipoic Acid (ALA), lycopene and zeaxanthin. L-glutamine and l-arginine, two of the amino acids in GNC Mega Men, support athletic performance and cardiovascular health. GNC men's vitamins are made with stevia and natural flavors and contain no added sugar or artificial sweeteners. Rich in nutrients, this formula looks good at first sight. However, some men may experience adverse reactions due to the high doses of vitamin D and B vitamins. If your diet already provides enough vitamin A, vitamin E, iodine, copper and other nutrients, this supplement could lead to overdosing. Let's take vitamin B12 or cyanocobalamin. This nutrient plays a key role in red blood cell formation and DNA synthesis, according to the National Institutes of Health. Even the slightest deficiency may increase your risk of pernicious anemia, neurological disorders and metabolic problems. GNC Mega Men also contains large doses of vitamin B6, niacin, thiamin, riboflavin and other B-complex vitamins. These nutrients may cause mild side effects, such as flushing, upset stomach and allergic reactions. As Linus Pauling Institute states, taking high doses of vitamin B6 long-term may result in sensory neuropathy, a disorder that causes pain and numbness in the limbs. These symptoms are more likely to occur when the daily dose exceeds 1,000 milligrams. This formula provides 100 percent of the RDA of vitamin A. If you eat a balanced diet, you may already have enough vitamin A in your system. Taking much too much of it can increase skeletal fragility and cause headaches, diarrhea, vomiting, dizziness and thinning of the bones, according to a 2013 article published in Endocrine Reviews. Too much vitamin D isn't safe either. GNC Mega Men delivers 400 percent of the RDA for this nutrient. According to a 2014 review published in the National Databases of Indian Medical Journals, hypervitaminosis D may cause lethargy, confusion, dehydration, frequent urination, gastric ulcers, high blood pressure and excess calcium in the bloodstream. In severe cases, it may lead to renal failure, hearing loss and even coma. To prevent any adverse reactions, stick to the daily recommended dosage as listed on the label. Unless you're combining supplements, taking several doses at once, or have been instructed by your doctor to limit vitamin A and D, the supplement itself is unlikely to cause vitamin toxicity when used in appropriate doses. Are GNC Men's Vitamins Safe? GNC Mega Men is designed to complement your diet and prevent nutrient deficiencies so you can function at your peak. However, if you already have a healthy diet, you likely don't need this supplement. A quick chat with your doctor will sort out whether it might benefit from it — and how to take it safely. Read more: Will Taking a Multivitamin Daily Give Me Energy? Environmental Working Group: How Much Is Too Much? Vitamin and Mineral Deficiencies in the U.S.